This is me on location in Christchurch. I am a freelance writer, but also a private tutor and public speaker. My website will tell you everything you need to know about all of my activities and how to get in touch with me if you think I can help you. To find out more about my writing, tutoring or public speaking, just follow the links on the left (couldn't be simpler). I work full-time from home, so am easy to get hold of (just have a look at 'CONTACT ME' below). If you want to know more about me, please read my 'Profile' page, which tells you a bit more about my misdemeanours from birth to present. The 'Destinations' and 'Photographs' pages have lists and pictures of many of the places that I've visited, as travel is an important part of what I write about. The Story of Blockley's industrial past - published in Cotswold Life - added to 'Writing' page as a download. Read about my visit to today's picturesque village to find out all about its silk mills. 'Surrey's War Memorials' - published in Surrey Life - added to 'Writing' page as a download. Read about my odyssey to reveal the stories of some of the names etched on the county's memorials. Another new testimonial added to my Speaking page (a talk given on 9th June 2016). 'Defending the Solent' - published in British Heritage Travel - added to 'Writing' page as a download. Read about the part played by Carisbrooke, Yarmouth, Calshot, Hurst, Southsea & Portchester in our defence. 'Shakespeare 400' - published in April's Cotswold Life - now added to 'Writing' page. Download the article and try and spot the 24 Shakespeare quotes, each from a different play. New testimonials added to Writing and Speaking pages. Take a look - I'm quite proud of them! 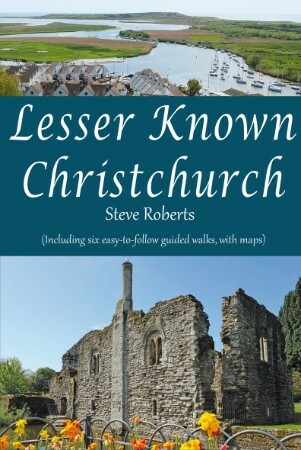 My book ('Lesser Known Christchurch') has now been published! Thank you to everyone who supported me by attending the book launch at Christchurch Priory. The book is on sale at several outlets around Christchurch, including the TIC, Red House Museum, Priory Gift Shop, Bookends, Highcliffe Castle and Town Common News. The book can also be ordered online via Amazon. Here's the front cover - more details on the Roving Press website (www.rovingpress.co.uk). If you take the trouble to get in touch with me, I will guarantee that you will get a response. I am very organised with my e-mail, so any e-mails will get replies. If you call on either landline or mobile and I am out, please leave a message and I guarantee I will get back to you. Your enquiry matters to me, so you will get an answer!